The dilemma for landowners making decisions about how to respond to the gas boom is the difficulty in determining how likely it is that something might go wrong. The big debate among local people continues to be over how widespread and likely the problems actually are. Of the seventy-three wells Cabot had constructed by the end of 2009, the DEP only identified fourteen as “defective” in the modification to the consent order, nearly twenty percent. Proponents of drilling emphasize the majority of wells not considered “defective”; on the other hand, to those who have been affected, twenty percent is intolerably high. To complicate matters further, Dimock is not exactly typical of natural gas-producing towns and could be argued to be a worst-case scenario. Carter Road was the scene of a high-profile disaster. Action by DEP against Cabot in the April 15, 2010 modified consent order was, at the time, one of the harshest actions ever taken against a Marcellus Shale driller in Pennsylvania. Dimock may be an anomaly; other towns might have much fewer problems, or no problems at all. The problem with trying to predict costs and benefits for Marcellus Shale drilling is that no one is sure what the magnitude of the risk really is. Even the frequency of drilling-related incidents is hotly disputed. In Dimock, the number of families who claim their water was contaminated by Cabot continues to grow. Fifteen families were part of the lawsuit that was originally introduced in November 2009; since then, that number has climbed to over thirty. By that count, if all of the cases are legitimate, the problems are still growing even within Dimock, despite the increased scrutiny the area has received. Those who oppose drilling suggest that, in addition to the high-profile incidents like Dimock, the Clearfield County blowout, and the West Virginia explosion, many others have been affected from lesser-known problems. Many people have pointed to Josh Fox’s anti-drilling documentary Gasland, which premiered on HBO in June 2010 and which featured several residents of the Carter Road area, as proof that drilling problems are widespread across the country. ProPublica, which describes itself as “an independent, non-profit newsroom that produces investigative journalism in the public interest,” has written a series of articles on “Buried Secrets: Gas Drilling’s Environmental Threat.” In an article posted on April 26, 2009, ProPublica detailed how officials in Colorodo and Ohio, in addition to Pennsylvania, had blamed gas drilling for water problems; on July 31, 2009, it reported that methane related to gas drilling had contaminated wells in at least seven counties in Pennsylvania since 2004. One of these was a story similar to that of Carter Road. In May 2009, the Pennsylvania DEP determined that Schreiner Oil and Gas Company had contaminated at least seven water supplies, two with methane and five with iron and manganese, on a road called Hedgehog Lane in Bradford Township in McKean County, according to a DEP press release. 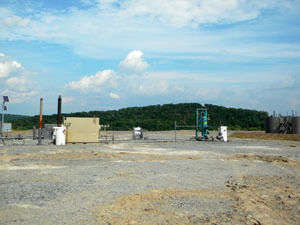 On the other hand, those who support drilling argue that people with problems are only a tiny percentage of the whole, and their problems are not even definitively linked to Marcellus Shale drilling, since naturally occurring methane is prevalent normally, as is noted on the Pennsylvania DEP website; and because the risks are so small, in this view, that they are outweighed by the benefits of drilling. According to a DEP Bureau of Oil and Gas Management Workload Report from the week ending July 23, 2010, 1,824 Marcellus wells had been drilled between 2005 and the end of that week. Of these, problems have only been confirmed in a handful, so the number of confirmed problems is small compared to the total number of wells drilled. Furthermore, it is possible for the drilling companies who do make mistakes to learn from them to avoid further problems in the future. In a July 25, 2010 article in The Times Leader newspaper, Cabot claimed to be doing just that, making adjustments to its policies and drilling procedures to avoid problems in the future like the spills that have plagued it in the past. “We had to come up with another way to try to do this thing in a manner that would not impact the environment. So basically what we did to turn this thing around for Cabot, we took a zero attitude towards spills. And this is going above and beyond regulations,” the article quoted Cabot drilling supervisor Jerry Dugas as saying. Despite the well-publicized problems around Carter Road, people continue to sign leases and drilling goes on. Both DePaolo and the Elys, for example, leased after what had happened on Carter Road was already widely known, assessing the risk of something similar happening to them to be outweighed by the benefits of leasing. The Elys say they were concerned about their water well; they used part of the lease money to get a comprehensive test done on their well, hoping that if something went wrong due to drilling, they could prove it. However, they also felt that it was important to keep the relative risks of drilling in a proper perspective. “I think in a lot of ways, because he [Mr. Ely]’s a beekeeper, I think we’re more concerned about the pesticides that people put on their lawns,” Mrs. Ely said. Natural gas drilling in Dimcok raises important questions that state governments—in New York as well as in Pennsylvania—and other communities like Dimock will have to answer as the reach of the drilling expands: What kinds of sacrifices are people willing to make in their pursuit of energy and profit? Even if things turn out okay for one person, is it acceptable to put others at risk? Or are the risks worth the potential gains? Objective answers to questions about the magnitude of risk are not yet clear, even in a town where drilling has now been going on for several years. Everyone will have to continue to watch Dimock and other similar communities in the future to see whether the muddy picture begins to clear up; as for now, those trying to predict the future have little to go on other than speculations about what might happen.